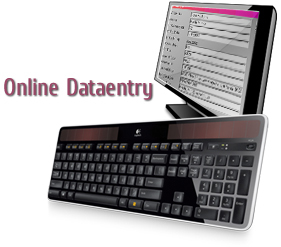 Outsource Data Processing, Conversion Job to DataEntryHelp.com: How to make huge money from data entry projects? Making money from data entry projects, if your typing speed is good and you can work full time or part time, without investment except a computer and Internet connection. This is typing job or basic office work job, you can not become a millionaire from this job however; you will make good pocket cash for the whole day. If you are from developing countries or if your country’s currency is down in value against US Dollar then you will not make some extra but due to exchange rate, you will get more. Let’s come to know this secret how to make money online from outsourcing data entry projects. Data entry projects are may tiny projects where your work is only typing, copying, pasting, collecting, for filling forms. There is not special education or training is required just good typing speed and basic knowledge about windows or any other operation system you are using is enough. If you have some extra experience about Microsoft Office, YouTube, face book and some other social networking sites like twitter, stumble, etc. then you will make money online a little extra. There is a marketplace where these projects are posted, in common words called freelancing sites, or outsourcing portals and some thing like this. It is simple just visit these websites and register as service provider make your profile. Now search the projects with keyword like this “data entry” “captcha solving”. You will see a list of projects. Now check them one by one if you found any project which is possible for you to complete then bid your price or if this is job then you will get fixed price as per day or per work basis. After this wait until project ends and winner announced. If you win the project then work will be given to you, and your task is to complete the work as soon as possible and return to the publisher, he will check your work, and then release the payment if he gets satisfied from your work. He will also post a comment on your profile and he will give you score positive or negative, which is feedback score which will also display on your profile. You will also comment and score the publisher on his profile. There are some ever green projects, try to win them, or some times jobs are also posted, don’t waste a minute to apply. I have searched these projects on some websites and found a lot of captcha data entry projects they are paying fixed pay per work basis. Other projects were collecting emails address from websites, making accounts on face-book, hot-mail, yahoo, and twitter, copying or moving data from one location to another, organizing data Microsoft Excel etc. These are so little projects you can complete in hours. Some projects are big and only for teams so don’t get these types of projects if you are single service provider and can not complete in given time.